I found this story particularly interesting, since I have already appraised 2 different George Barris Oldsmobile Toronado 67X. Listed on e-bay a third 67X that looks nothing like the other 2 and yet there are only supposed to be 2 left. 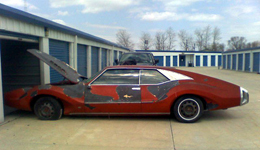 The car you see below is dubbed Toronado 67X, and according to the seller on eBay, it is one of the only two cars remaining. The big coupe was originally gold, but time and poor treatment have turned it a lovely shade of something other than gold. Cars like this are fun to appraise since they are nothing more than a movie prop, but since the famous builder George Barris built it has a sentimental value to someone.